NEW ORLEANS – One of the most anticipated weekends in cross country is finally here! 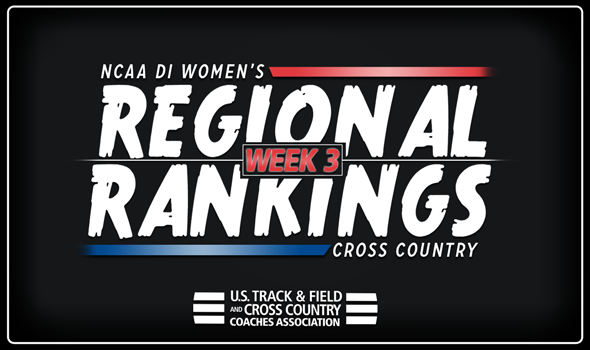 And precluding it is Week Three of the NCAA Division I Women’s Regional Rankings that were released on Monday by the U.S. Track & Field and Cross Country Coaches Association (USTFCCCA). Expect big changes to occur as the majority of teams in the top-five of each region will be at either the Nuttycombe Invitational, the Greater Louisville Classic, the Roy Griak Invitational or the Joe Piane Invitational as the top teams in the sport are set to do battle this weekend. There wasn’t much shakeup to the regional rankings as teams were gearing up for these prestigious meets. Four of the nine regions saw no movement at all to its top-five although there were big changes to the Northeast and South region that included two new No. 1 selections. There was no movement to the top of the Great Lakes region for the fourth consecutive poll. The top-five remained the same as each team did not race this weekend. Holding the No. 1 spot is Wisconsin who will host the Nuttycombe Invitational at the Zimmer Championship Course this Friday. It is the second of four races that Wisconsin will host this year which includes Pre-Nationals and the NCAA Championships. Remaining in No. 2 is Michigan who will head to Kentucky for the Louisville Classic this weekend. Joining the Badgers at Nuttycombe will be No. 3 Michigan State and No. 4 Indiana while No. 5 Notre Dame hosts its Joe Piane Invite at the Notre Dame Golf Course on Friday. This group could see even more of a shake up at Pre-Nationals on October 13 as four of the current top-five will be competing. Just like the Great Lakes Region the Mid-Atlantic Region saw little to no movement throughout its top teams as they were all idle this past weekend as well. Remaining in No. 1 is Villanova who took over the top spot just a week ago. Right behind them is No. 2 Penn State who will be looking to retake the top spot that it held for the opening two polls with its performance this weekend. The top-five is rounded out by No. 3 Georgetown, No. 4 Princeton and No. 5 Penn. Villanova, Penn State, Georgetown and Penn will all go head-to-head at Nuttycombe this weekend. In what will be a growing trend the Midwest Region also did not have a single change to its top-five. Iowa State remained in No. 1 and was followed by No. 2 Minnesota, No. 3 Oklahoma State, No. 4 South Dakota and No. 5 Northwestern. Minnesota was the only squad in the top-five to race this past weekend as the group won the St. Olaf Invitational on Saturday. Maria Eastman posted a runner up performance with a new career-best 6K time of 22.50.9. Iowa State and Oklahoma State will match up at Nuttycombe while Minnesota and South Dakota will be at the Roy Griak Invitational. Northwestern will be in South Bend for the Joe Piane Invitational. While the top-four in the Mountain Region might have stayed there same a new unit did move into the top-five for the first time this season. None of the top-four teams raced as No. 1 New Mexico, No. 2 Colorado, No. 3 BYU and No. 4 Utah State all remained in their spots from the previous poll. The big jump of the region belonged to Utah who improved two spots to No. 5 this week. The Utes debuted a full top seven to placed third at the Coast-to-Coast Battle in Beantown this past Friday. They were led by freshman Scarlett Dale who finished in 14th-place. The Utes finished ahead of four different nationally-ranked teams in the field at the meet. New Mexico and Colorado will face off at Nuttycombe this weekend. BYU will be at the Joe Piane Invitational while Utah State will compete at the Paul Short Run. Utah is off from competition. For the first time in program history Dartmouth was named the top team in the Northeast Region after a two-spot improvement from the previous poll. Dartmouth is fresh off a fifth-place finish at the Battle in Beantown in which the unit ran a tight race with just an eight second difference between its top-five athletes and just 23 seconds between all seven competing athletes. Right behind them is another big gainer in No. 2 Brown who jumped up five spots from the previous week after a sixth-place finish at the Battle in Beantown. No. 3 Syracuse, No. 4 Providence and No. 5 Columbia round out the region’s top-five. The top-five teams won’t see each other much during the regular season with just Providence and Columbia heading to Nuttycombe and Syracuse and Yale meeting at Pre-Nationals. Dartmouth and Brown will also battle at the New England Championships on October 6. There’s a new No. 1 in the South Region as Ole Miss moved into the top spot for the first time this season after the Rebels collected the team title at the Battle in Beantown this past Friday. Despite sitting two All-Region runners, Ole Miss knocked off four nationally-ranked teams in winning the meet with a 102-point showing. The group was led by Lisa Vogelgesang who finished in tenth place. The move was a five-spot improvement for the Rebels since the previous poll. Improving one to No. 2 is Georgia Tech who finished second at the Battle in Beantown. The Yellowjackets were nudged out of the top spot by Ole Miss by just two points. No. 3 Georgia, No. 4 Florida State and No. 5 Mississippi State rounded out the top-five. Georgia will compete at the Paul Short Run this weekend, Florida State will be at the Joe Piane Invitational and Mississippi State will run at the Greater Louisville Classic. Ole Miss and Georgia Tech are both off. Arkansas, fresh off a win at the Chile Pepper Festival, remained at No. 1. The Razorbacks were paced by individual champion Katrina Robinson at the meet to collect a victory with a 34-point performance. They were followed by No. 2 Texas, No. 3 SMU and No. 4 Baylor. Rounding out the top-five was No. 5 Texas A&M who improved one spot to move back into the top-five for the second time this season and first since the preseason poll. The Aggies won their Texas A&M Invitational with Kelsie Warren leading the way with the individual victory in what was a wet and sloppy course. Arkansas and Texas will be at Nuttycombe while SMU will head to Louisville and Baylor goes to Notre Dame. Baylor will be at the Loyola Lakefront Invitational in Chicago this weekend. The top three teams in the Southeast Region remained the same for the fourth consecutive week while there was a flip-flop at No. 4 and 5. The No. 1 team, NC State, will finally get its season underway with the running of Nuttycombe this weekend. No. 2 Furman will be at Notre Dame while No. 3 Virginia Tech will head to Paul Short. Trading places at the back end of the top five was No. 4 Wake Forest and No. 5 Duke. Wake Forest will join Virginia Tech at Paul Short this weekend while Duke will make the trip to South Bend with Furman. The West Region brought back some stability to the poll as the top-five teams in the region all remained the same from the previous week. In fact the top-five standings have remained the same in the West since the preseason. The top spot remained with No. 1 Stanford for the fourth-straight week while No. 2 Oregon, No. 3 Boise State, No. 4 Washington and No. 5 California followed behind. The Ducks were the only team in the top-five to race this weekend and they recorded an impressive showing in winning the Bill Dellinger Invitational. Oregon placed the top-seven athletes at the meet and Susan Ejore collected the individual title. Stanford and Washington will compete at the Stanford Invitational this weekend while Boise State will be at Nuttycombe and California will compete at Notre Dame. Oregon is off.